WinADay.com, the three-dimensional online casino launched recently by Slotland.com, has added another new 3D slot machine to their games lobby. The new Heavenly Reels slot machine is a four pay line slot adorned with heavenly cherubs and with angel wings spinning on its wheels – so much fun it’s nearly sinful. The Heavenly Reels “Treasure Box” is a special bonus fund that accumulates during game play. Any amount bet on a pay line that lands on the “Wild” symbol – a celestial pig with angel wings -- is added to the Treasure Box which players can open and claim when they match a special code below the reels. 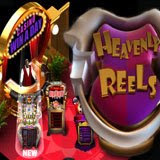 To celebrate the launch of the new game, WinADay.com is offering two special Heavenly Reels bonus prizes. The Big Spinner bonus will go to the player that places the most total bets on Heavenly Reels between October 21 and 31. They’ll get 100% of the deposits used for that play refunded. The Triple Luck prize will go to the player that wins the most in a single spin during the same period. They will receive triple their winnings for that spin. WinADay.com developers are hard at work on two more totally unique 3-D slot machines. Diamond Mine and Puzzle World will be added to the games lobby in coming months.